"The passing away of his foster-parents greatly grieved Clark Kent. But it strengthened a determination that had been growing in his mind. Clark decided that he must turn his titanic strength into channels that would benefit mankind. 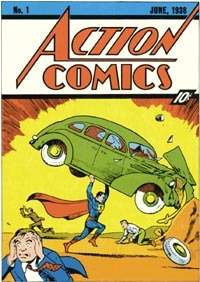 And so was created..."
In Action Comics #1, a one page origin of Superman is given. This was expanded to two pages for Superman #1, which also featured four additional pages tacked on to the begining of Superman's first adventure. Both of these versions are abridgements of the story as actually written by Jerome Siegel and Joseph Shuster in the early '30s. That version had initially been prepared in 1934 as a newspaper comic strip and submitted to syndicate after syndicate collecting rejections. The tale had been rewritten and recut several times, with no version achieving much success. Unable to sell the strip anywhere, Siegel and Shuster used concepts from it in strips they were handling for DC Comics, notably "Federal Men" and "Dr. Occult." In these features, a man named Jor-L and the classic red-and-blue tights first appeared. Success for Superman himself finally occurred when M.C. Gaines bought the feature for a new comic he was packaging, the now famous Action #1. The newspaper adventure strip was cut up and reassembled into comic book pages. Presumably, Gaines thought the story was too long, or perhaps too slow moving for his readers, so the origin sequence was severely truncated. "Krypton, a distant planet so far advanced in evolution that it bears a civilization of super men - beings which represent the human race at its ultimate peak of perfect development!" Yes, on the original planet Krypton, all people had the ability to run at super speed and leap an eighth of a mile. The strip opens with Jor-L racing through the streets of the city and leaping to the balcony of his home, as Krypton is wracked by the vast quakes which will soon lead to its destruction. Faced with a catastrophe that even the super-powered Kryptonians cannot survive, Jor-L and Lora place their infant son, Kal-L, into an experimental rocket and launch him into space. The rocket lands on Earth where the baby is adopted by the Kents. He grows up to find that "nothing less than a bursting shell" can pierce his skin. As an adult, Clark moves to Metropolis where he obtains a job on the Daily Star, working for editor George Taylor. We come across the first inconsistency here, for in Action Comics #2, Clark Kent is portrayed as working for the Cleveland Evening News! Presumably, this is an earlier version which the proof-reader neglected to correct. Although the Earth 2 Superman is portrayed as being the character who appeared in the comics in the '40s, a number of differences exist. Perry White first appears as Clark Kent's boss in Superman #7 in December 1940, although the Earth 2 Superman supposedly never met Perry until after Clark Kent became editor of the Daily Star in the early '50s. 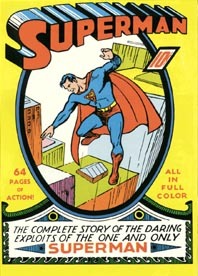 The Daily Planet first appears in Superman #4, Spring 1940, with George Taylor as its editor. In another discrepancy the Earth 2 Luthor is portrayed as red headed, but the bald version of Luthor first appeared in Superman #10, June 1941. 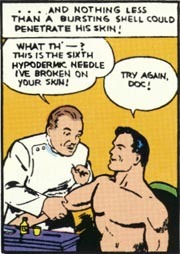 The 1940s Superman also seems to have had a power that the Earth 2 Superman lacks, the ability to use his "super muscular control" to contort his face into any form of disguise that he wishes. This power was first used in Superman #18 and continued to be used through the end of 1947. In 1942, a novel by George Lowther appeared, repeating essentially the same origin as the newspaper strip, except that, for the first time, the spelling "Jor-El" was used. Lowther was also the first person to name the Kents, as Eben and Sarah, names which, since then, have only been used in the first episode of the original TV series. 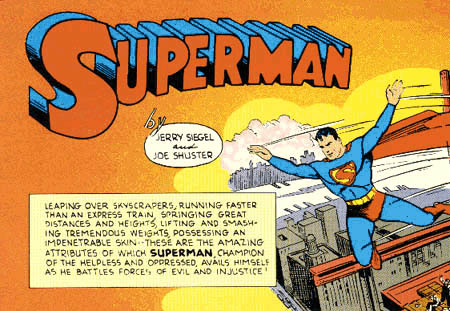 The 1940s version of Superman was essentially a sort of "super-Roosevelt." He spent most of his time helping to save people from natural disasters or corrupt business men. He thought nothing of leveling entire neighborhoods of slum dwellings in order to force the city fathers to build decent housing. He used his powers to terrorize munitions makers who were, in his mind, the cause of all wars. Except for the Ultra-Humanite and Luthor, there didn't seem to be any supervillains for him to face. Still, his powers grew rapidly, probably in order to continually give the readers bigger and bigger thrills. Superman kept getting stronger, faster, and more invulnerable. Pretty soon it became hard to conceive of all Kryptonians as having been super-powerful. Why didn't they all just fly away when Krypton exploded? Article by Bob Hughes - Originally presented in Amazing Heroes #96, June 1, 1986. Golden Age Superman stories are reprinted in Superman Archives, available at your local comic book store and at our online bookshop.